Hope you can make it...... I'll add you to the list 👍 I'm in Telford so cant comment on the convoy question. Still on Sunday 7th April or on the Saturday....? I presume we're looking at a PM meet for this location, Is this still Sunday ? Hopefully on a Sunday morning the service are will be quiet..... If it doesn't work out we can look for another location for the next meet. Any joy finding a better location Jon ? 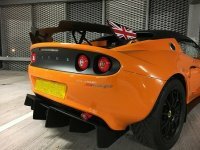 Anyone have or know where to get an S2 Exige silhouette image file? No problem, sorry I missed you, I got there around 2pm and as you said it was rammed, some nice cars and bikes there including a couple of hot rods, cafe racer bikes and some old yank cars along with a few too many boring BMW's and alike. What time you aiming to be there at ?